Northmor’s Maddie Hoverland tries to slap down a hit against East Knox in her team’s 10-6 win Thursday. 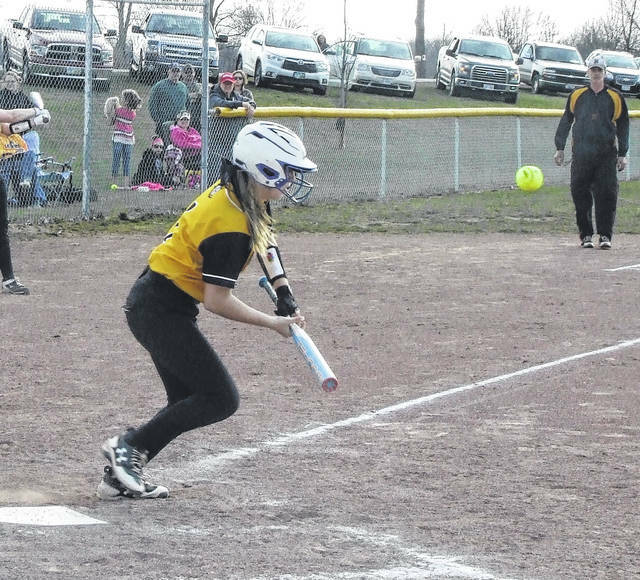 Timely hitting proved key for the Northmor softball team in claiming a 10-6 win over visiting East Knox on Thursday. While the Bulldogs struck first, the Knights battled back to pick up the KMAC victory, getting three runs in the fifth inning and two more in the sixth to open up a sizable lead in what had been a close game. “We’re always talking about two-out runs and hits and we did a lot of that tonight,” said head coach Russ Montgomery. It was East Knox that first struck with two outs, as they scored two in the first inning on a two-out ground ball that was misplayed by the Knights. Montgomery noted that some sloppy fielding led to that early deficit, adding that one of the Bulldog base-runners reached on a bunt that no one got to in time to make a play. The Knights would quickly bounce back. Maddie Hoverland and Lily Tate had back-to-back one-out singles for the team and would advance to second and third base on a sacrifice fly by Rosie Sklenicka. Adkins then hit a ground ball, but the throw to first base was errant, allowing both base-runners to score. East Knox would score two more runs in the top of the third, but Northmor battled back in their half of the inning. Cristianna Boggs opened with a triple and scored on a sacrifice fly by Tate to make the score 4-3 with two outs. Sklenicka then reached on an error and Adkins, Aly Blunk and Alee Ivy contributed three straight singles, with Blunk’s and Ivy’s bringing in runs to give the Knights their first lead of the game at 5-4. Pitching with a lead, Adkins only gave up two base-runners over the next three innings. Her offense would give her a lot more breathing room in the fifth and sixth innings. Tate led off the fifth with a solo home run. Sklenicka followed with a single, but the Bulldogs would record two quick outs. However, Ivy, Kelsie Fike and Morgan Wiseman followed with three straight singles, with Wiseman driving in a run. Boggs would then be walked with the bases loaded to make it 8-4. In the sixth, Blunk and Ivy both had run-scoring singles to increase the Northmor lead to a six-run margin before East Knox attempted to battle back in the seventh with two runs before the Knights were able to close out the game. Adkins finished with nine strikeouts, two walks and eight hits surrendered. Offensively, Tate had a home run and single, while Blunk had two hits and Boggs tallied a triple. “We always tell them to have faith and if we’re down a couple runs, know we can take the lead,” said Montgomery of his team’s fighting spirit in the contest.